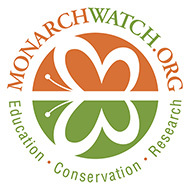 Monarchs and pollinators need our help due to habitat loss. Who will be considered for free milkweeds? Once you have applied, save the confirmation email that you receive. If you do not receive a confirmation, your form was not submitted! Answer all questions to the best of your ability. Questions? 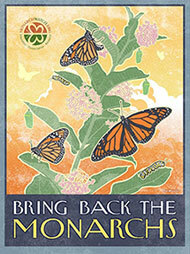 Email Angie Babbit at milkweed@monarchwatch.org. If your organization qualifies, we will provide a free flat of 32 milkweed plugs as well as guidance on how to create a new habitat or enhance an existing garden. The Natural Resources Defense Council (NRDC) has provided funds for this project. Clear, digital photos, maps of the garden and a letter of support are required for consideration. You will be prompted to upload these documents. Applications will be reviewed in the order that they are received. The native milkweed that is awarded to qualified applicants comes in “plugs.” These are live plants that have been grown in a restoration nursery. The plants are often trimmed to increase the root mass, or are trimmed for shipping. This does not harm the plants, and can actually benefit them. Unlike nursery plants, restoration plants are grown for habitat restoration, not for aesthetic value at the time of planting. Aphids and many other greenhouse pests are herbivores. They may be on the plants because the greenhouse is growing the plants for herbivores (monarch caterpillars), and therefore they can’t treat the plants with pesticides. Sometimes, when the plants arrive, they have been trimmed and they have aphids, so they look unlike plants you would get from a local plant distributor. Please plant them and tend to them. They will recover, and the aphids will probably diminish if not disappear.